After the significant progress in the completion of the rail line in the state of Jammu & Kashmir, the Indian Railways endeavours to extend the socio-economic benefits of rail transportation to other remote areas and challenging terrains of the hilly states (HP & J&K) where development is scarce. Amongst the various socially desirable projects in the country, Bilaspur-Mandi-Leh Rail Line (route length 498 Kms) constitutes great significance. The project is of both strategic and economic, development and tourism importance, with its unique distinction being the highest railway track in the world. Minister for Railways Shri Suresh Prabhakar Prabhu laid the foundation stone for the Final Location Survey Of Bilaspur-Manali-Leh New Broad Gauge Line, at Leh today (27th June 2017) in the august presence of distinguished guests on the occasion. Shri R.K. Kulshrestha General Manager, Northern Railway and other Senior Railway officials were also present in the function. Leh is the most important town in Ladakh region of J&K State having approximately 1.5 lakhs population. It has a high footfall of Indian & Foreign tourists each year. The district Leh is the second largest district in the country with elaborate Army Establishments and is the Headquarter of 14 corps. The region being a cold desert, the temperature during the winter months (Oct-Mar) plummets down to well below freezing point. The road connectivity to this area is gets cut off from other parts of country due to heavy snowfall, thus necessitating all weather rail connectivity both for strategic as well as socio-economic needs. In order to connect Leh with a broad gauge railway line with the rest of the country, Indian Railway have taken up Final Location Survey, a precursor to actual construction from Bilaspur to Leh via Manali. The alignment shall connect Mandi, Kullu, Manali, Keylong and other important towns of Himachal Pradesh & Jammu & Kashmir states enroute. The line from Bilaspur shall be further connected to Bhanupali between Anandpur Sahib and Nangal Dam. 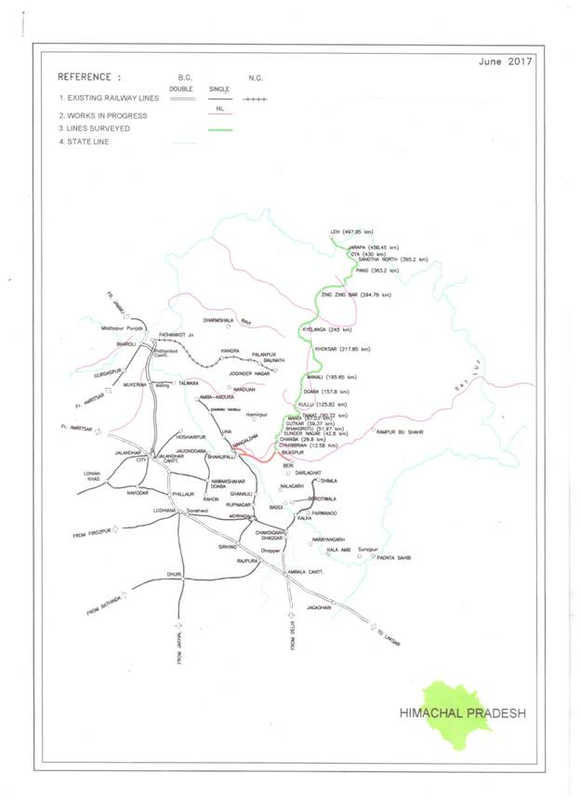 The Proposed alignment passes through the Shivalik, Great Himalayan & Zanskar Ranges, areas with wide variation in height (600m to 5300 m above MSL) and Seismic zone IV and V [ IS:1893(Part-I)-2002], necessitating building of large number of tunnels, deep viaducts & bridges. The work of Final Location Survey has been entrusted by Ministry of Railways to RITES Ltd and is planned to be completed by March 2019 with an approximate cost of 157 crores. State of Art technologies are being employed to have a constructible, most economic, safe, and all weather railway line. Development of corridors with different grades using Digital elevation Models, with overlays for Geological Maps, Snow & Avalanche Studies, Hydrological & Seismic Data using the latest software and selection of most optimum corridor. Analysis of the selected corridor and development of most suitable alignment. Geological and Geophysical investigations and design of bridges, tunnels & viaducts. Marking of central line of alignment on site. Preparation and submission of Detailed Project Report. The construction of railway line in such difficult and treacherous terrain would be a daunting challenge for Indian Railways and would be an unmatched marvel globally once completed. Proposed Line is to Provide all Weather Rail Connectivity to the Remote Regions of Himachal Pradesh and Leh-Ladakh After the significant progress in the completion of the rail line in the state of Jammu & Kashmir, the Indian Railways endeavours to extend the socio-economic benefits of rail transportation to other remote areas and challenging terrains of the hilly states (HP & J&K) where development is scarce.